Unable to match the Empire’s production of military equipment, the Rebel Alliance makes do with whatever they have on hand—which often means converting civilian vehicles into weapons of war. In addition to being outfitted with stolen weaponry to support Rebel soldiers in combat, the nondescript appearance of these vehicles is often useful in avoiding capture. Soon, you’ll be able to adapt one of the Star Wars saga's most iconic speeders to fit your needs on the battlefields of the Galactic Civil War. 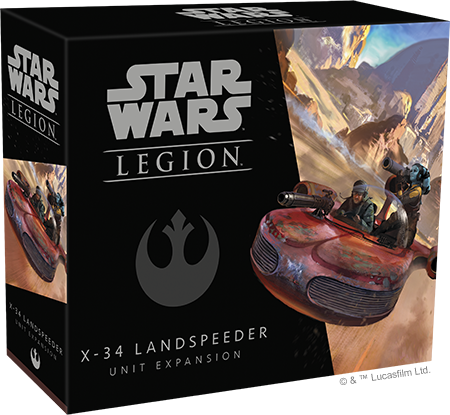 Fantasy Flight Games is proud to announce the X-34 Landspeeder Unit Expansion for Star Wars™: Legion! Order your own copy of X-34 Landspeeder Unit Expansion at your local retailer or online through our website today! Already a speedy craft thanks to its powerful repulsor engine, an X-34 Landspeeder becomes a threat to even the toughest Imperial opponents when driven by an experienced pilot and equipped with an assortment of weapons. 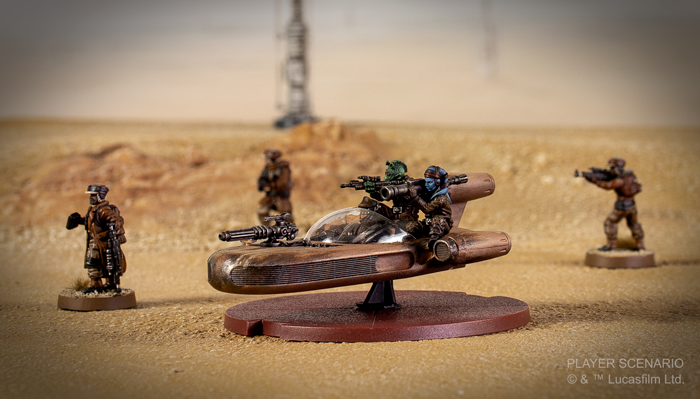 The X-34 Landspeeder Unit Expansion adds one X-34 landspeeder miniature—complete with two unique weapon options—to your Rebel armies. Along with the beautifully sculpted, finely detailed miniature, you’ll find a unit card and all the tokens you need to get your X-34 up and running, as well as a range of upgrade cards to customize it to your specific battle plans. The X-34 Landspeeder’s origins as a civilian transport make it perfectly suited for crossing the rough terrain that's commonly seen on the battlefields of the Galactic Civil War. When combined with some passengers carrying blaster rifles—or heavier weapons plugged directly into the speeder’s overcharged power converters—it suddenly becomes a capable military vehicle that can employ hit-and-run tactics to quickly accomplish your objectives. 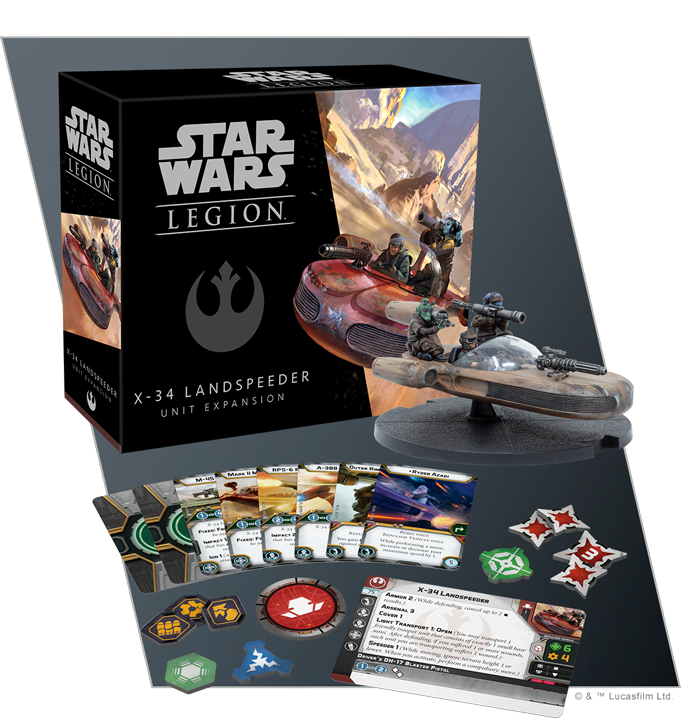 Entering Star Wars: Legion as the Rebellion’s second heavy unit, the X-34 Landspeeder gives you another option for giving your army some much needed power. As opposed to Imperial vehicles like the AT-ST and TX-225 GAVw Occupier Combat Assault Tank, however, the X-34 Landspeeder’s power comes from something other than raw strength. Like the T-47 Airspeeders also employed by the Rebellion, the X-34 Landspeeder also moves incredibly fast, moving at speed 2 and performing a compulsory move when it activates. But the X-34 features one crucial feature that the T-47 does not: as a vehicle with Light Transport 1, it can transport one friendly trooper unit consisting of exactly one small base mini, perfect for delivering a commander like Luke Skywalker into the heart of battle, where he can do the most damage. Even if your X-34 does come under enemy fire on the way to an objective token, it remains surprisingly durable. With Armor 2, it can cancel up to two hits while defending, giving it a chance to weather enemy fire long enough to deliver its passengers. All this speed and durability does come at a cost, however. The X-34’s civilian design does not incorporate any weapons of its own, leaving you to find other ways to supplement the driver’s DH-17 Blaster Pistol. Luckily, the X-34 leaves you plenty of room to get it battle ready. On top of the friendly trooper unit it can carry, the landspeeder also has room for two other passengers that can be equipped with a wide variety of weaponry, from basic A-300 Blaster Rifles to a RPS-6 Rocket Launcher for extra stopping power. Adding extra riders is far from your only option for modifying your X-34 landspeeder. It also features a single hardpoint upgrade slot for either a Mark II Medium Blaster or an M-45 Ion Blaster, giving you even more freedom to choose your loadout. Not only do these weapons offer different tactical options, they also invite you to customize your X-34 miniature based on which weapon you’ve equipped. No matter what weapons you choose, the team you’ve assembled can operate as a single unit thanks to the landspeeder’s Arsenal 3 keyword, creating a diverse attack pool that can rival even the most powerful Imperial units. A good landspeeder can be a boon to anyone. In the hands of ingenious Rebels, it can become one of the most effective military vehicles in the galaxy. Look for the X-34 Landspeeder Unit Expansion (SWL36) in the second quarter of 2019! You can pre-order it at your local retailer or online through our website today!